Instant Pot ‘Pot in Pot’ (PIP) is a cooking method that allows you take pressure cooking to the next level. The Pot in Pot cooking technique allows you to pressure cook cheesecakes, desserts, and other foods that don’t contain liquid. Pot in Pot also allows you to cook dishes that tend to scorch, and to make multiple dishes at the same time. Once you get the hang of the Instant Pot and you’re able to successfully make straight-forward recipes, you start to ask what else this wonderful gadget can do. For instance, maybe you’ve heard the term ‘Pot in Pot’ and wondered what it is. Pot in Pot cooking (also referred to as PIP) is a really useful Instant Pot (pressure cooker) technique. I’ll give you a summary of why you’d want to use this technique and walk you through the steps to combine two recipes that you can cook together. 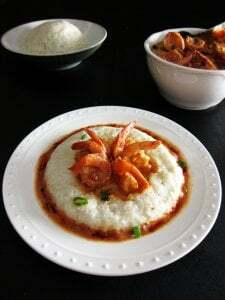 By the way, if you’ve made my Instant Pot Shrimp and Grits recipe, then you’ve already used the Pot in Pot technique! 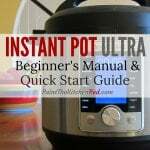 Note: If you’re new to the Instant Pot and aren’t familiar with how to use it, please read the Instant Pot DUO Beginner’s Quick Start Guide or the Instant Pot ULTRA Beginner’s Quick Start Guide. What is Pot in Pot Pressure Cooking? The Instant Pot ‘Pot in Pot’ method of cooking allows food to cook in a separate bowl that’s placed on a steam rack in the Instant Pot. Steam generated from liquid below the steam rack is used to build pressure and cook the food. Add 1 cup water to the bottom of the inner pot. Note: The quantity of food you can cook in a Pot in Pot container will be less than what you can cook directly in the inner pot. You might need to adjust recipe quantities. What Accessories are Used for Pot in Pot Cooking? Raised steam rack that is placed in the Instant Pot inner pot. The Instant Pot is shipped with a steam rack, and that works perfectly well. There are many types of racks – as you can see from my collection! Note: the container being used for PIP cooking must be placed on a rack, and not directly in the inner pot. Oven-safe container made of stainless steel, oven-safe glass, silicone, or ceramic/porcelain. The container shouldn’t touch the walls of the inner pot and should allow the Instant Pot lid to be closed easily. Flat wire rack to separate and stack multiple glass or metal containers if not using the stackable containers described above. 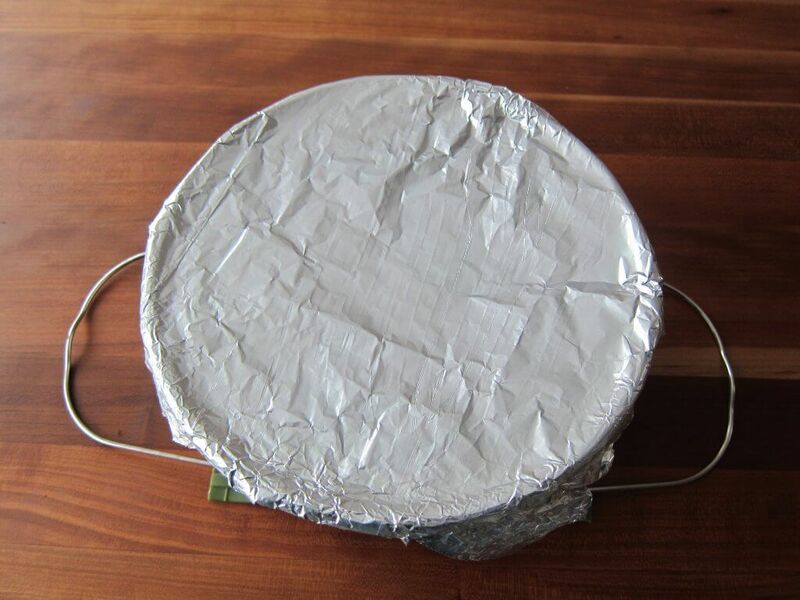 If you don’t have a steam rack with handles to lift the container out, you can make an aluminum foil sling to remove your container from the Instant Pot. 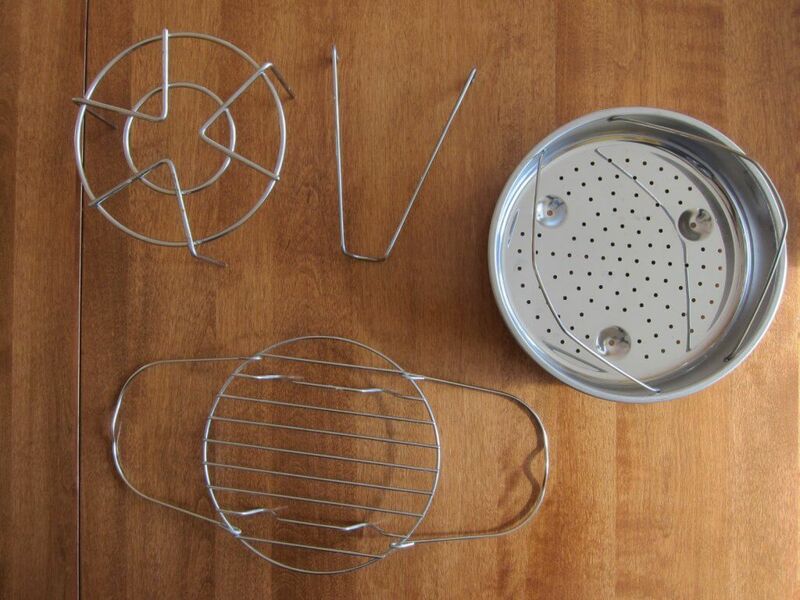 Some models of Instant Pot are shipped with the rack that has handles. Aluminum foil to cover the container and prevent condensation from dripping in. What are the different uses of Pot in Pot Cooking? I’ve used the Pot in Pot method to salvage a meal when I get the dreaded ‘Burn’ error and food is scorched on the bottom of the inner pot. 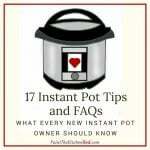 I empty out the contents of the Instant Pot, clean out the inner pot, and use Pot in Pot to finish up the cooking. If you’re using canned tomato sauces or purchased sauces with ingredients like corn starch or tapioca starch, you can have problems with scorching. This keeps the Instant Pot from reaching pressure. Or you may have a recipe with a thick gravy. Pot in Pot cooking is a great way to cook with these types of foods without having to thin the sauce with water or broth. Another example is oatmeal. Oatmeal cooked directly in the inner pot can be difficult to cook properly and it can also be pretty messy. Pot in Pot works really well for oatmeal. 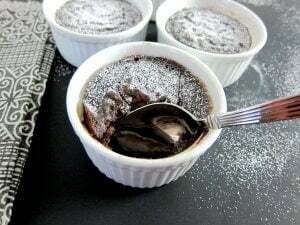 A bain marie (pronounced ‘bahn ma-ree’) is a water-bath cooking technique used for delicate desserts that are baked in the oven, and serves to slow down cooking by using steam to evenly cook the dish. These recipes are perfect for the Instant Pot! Do you heat up leftovers in the microwave? At our house, by the time five people heat up their food, the first person’s food is already cold! 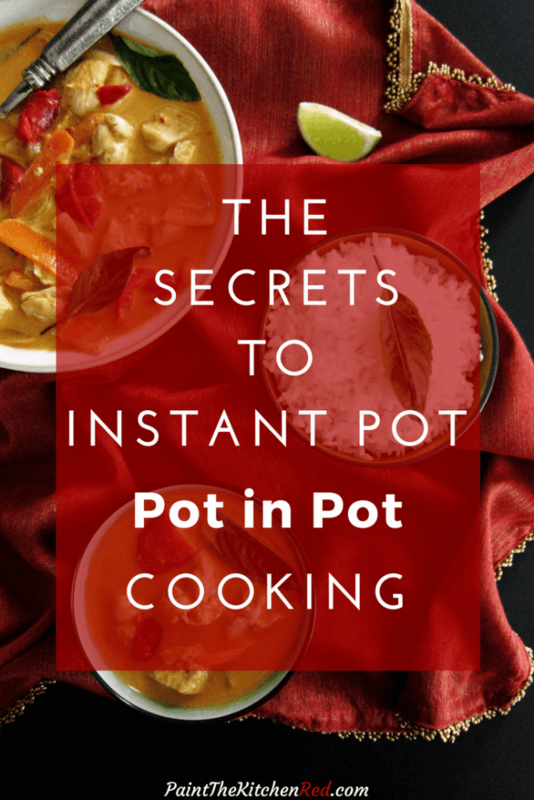 A great solution is to reheat food in the Instant Pot, using the Pot in Pot method. Just store the leftovers in the fridge in oven-safe containers, and reheat in the Instant Pot using the Pot in Pot technique. Note: going directly from the freezer to the pressure cooker can cause a glass bowl to crack. You can stack multiple containers separated by a wire rack, or use these stackable containers that work great in the Instant Pot. Then just use the ‘Steam’ or ‘Pressure Cook’ function for 3 to 5 minutes, depending on the type and density of your food. I like to pressure cook delicate vegetables (cauliflower, broccoli, peas, etc) or seafood on low pressure. However, your Instant Pot model may not have the low-pressure option, or you may be using a recipe that calls for high pressure. Cooking these delicate foods directly in the inner pot, even in a steamer basket, can cause them to overcook. Cooking them in a separate container using PIP helps to slow down the cooking process. I’ve found that using a glass container versus metal, and covering the container with a double layer of foil or a lid, also slows down cooking. 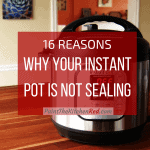 I love the fact that the Instant Pot makes cleanup really easy – only one pot to clean! If you have a smaller quantity of food to cook, you can make cleanup even easier. Use the Pot in Pot method to cook your food, and serve and store it in the same container. I do this all the time with Instant Pot Rice. I use a Pyrex dish to pressure cook the rice using PIP, and I don’t need to clean out the inner pot. Plus I can store leftovers in the same dish! For me, cooking a whole meal altogether is the most exciting use of Pot in Pot. This method of cooking is very common in Indian kitchens and it’s something I’ve grown up with. This set of stackable containers is a really handy accessory for cooking Pot in Pot meals. It allows you to put different foods into the compartments and cook them at the same time in the Instant Pot. Although the stackable containers are a handy accessory, you can cook multiple dishes without them. You can just stack bowls, separated by a wire rack. Or you can have one of the items (as long as it has enough liquid to bring the Instant Pot to pressure) cook directly in the inner pot, and place the second item in a separate container on a steam rack. Pressure level (i.e. low or high pressure). Pressure release method i.e. quick release (QR) or natural pressure release (NPR). You can use the Pot in Pot cooking method to combine many different types of recipes. The Instant Pot recipe book that came with your Instant Pot has cooking times for different foods. I use the timings as a general guideline for which foods I can pressure cook together, using Pot in Pot. What do you do when the pressure cooking times for the two recipes are different? As I mentioned above, the recipes you cook together using Pot in Pot should have about the same cooking time. So how can you solve the problem of different cooking times? Partly cook the longer-cooking item, do a quick release of pressure, and add in the second item and continue cooking both items. e.g. if item A has a cook time of 15 minutes and item B has a cook time of 10 minutes, you’ll pressure cook item A for 5 minutes, quick release (QR), open the lid and add in the container for item B (on a rack or stacked), close the lid and pressure cook both for 10 minutes. Tightly cover the container of the faster-cooking item with a double layer of aluminum foil. The foil slows down the cooking of the contents. Cut the slower-cooking item (e.g. meat) into small pieces so that it takes less time to cook. Cook the faster-cooking item in a glass, ceramic or silicone container versus stainless steel because that will slow down the cooking time a little bit. If you were cooking both dishes separately, you’d cook the Thai red curry, empty out the contents into a serving dish, clean the inner pot, and then cook the rice. I’m going to show you how you can save time and cleanup by using the Pot in Pot method of cooking multiple items together. The recipe states that you need to cook Jasmine rice for 4 minutes. That’s perfect because that’s how long the chicken in the Thai red curry needs to cook for. But there’s a problem. Remember how I mentioned that they both need to have the same method of pressure release? 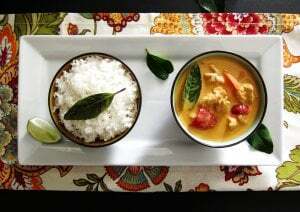 You’ll notice is that the Instant Pot Thai chicken curry recipe calls for quick release of pressure (QR), while the rice calls for 10 minute natural pressure release (NPR). 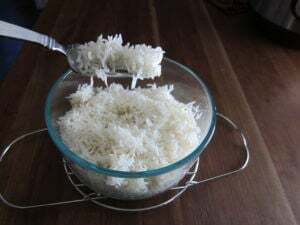 If you cook the two dishes together and do a quick release, the rice won’t be cooked properly. So the only other choice is to do a natural release. Chicken thighs do well with natural release, so problem solved. Prepare the Thai red curry up until the pressure cooking step. 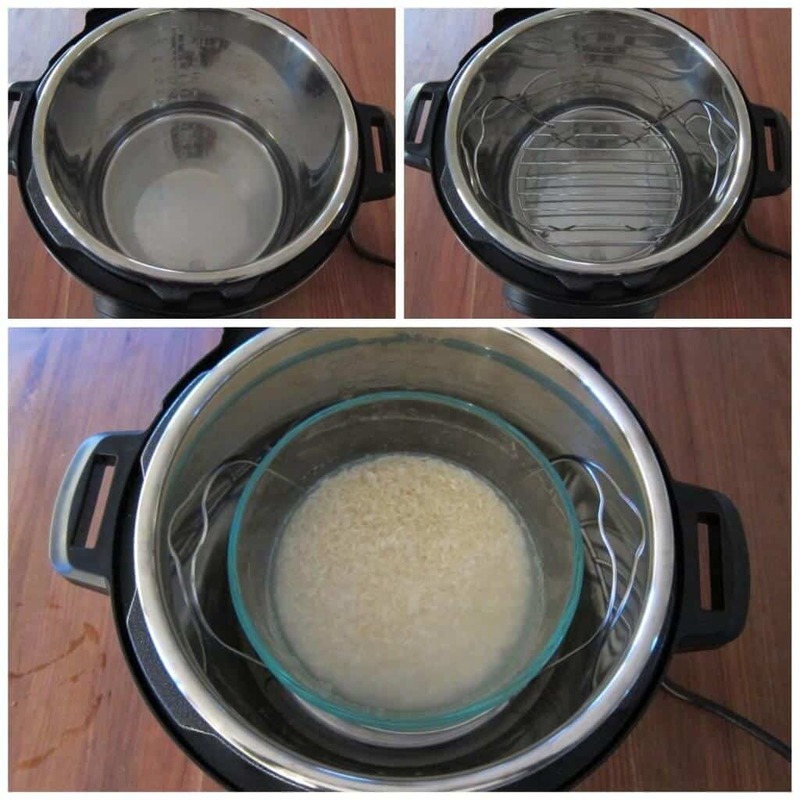 Prepare the Jasmine rice up until the pressure cooking step. Place a tall steam rack in the curry. Place the rice container on the steam rack. Pressure cook both items for 4 minutes and do a natural pressure release (NPR) for 10 minutes, and then quick release (QR) any remaining pressure. Continue with the Thai red curry recipe by adding vegetables and cooking the curry in ‘Saute’ mode. * You may have to clean the bottom of outside of the Pyrex dish, due to splatter. I hope this article has made you more comfortable using Pot in Pot cooking. If you found it helpful, please leave a comment and/or share on social media using the social media share buttons at the top and bottom of this post. Thank you! Marilyn, I’ve not made Angel Food cake in the IP. But here’s a recipe from The Typical Mom Looks like she bakes it for 27 minutes. However since your pot in pot pan will be much smaller, you’ll need to decrease the cooking time. Sorry, but I’m really not sure how long you’d cook it for. So happy for this post. I just did not get what people were talking about this pot in pot Instapot cooking! And now I don’t feel so silly for not knowing! I really appreciate the step by step detail. Thank you Monica, glad to help! Curry and rice is a great way to try it out. This is an excellent article! I’ll be sharing it! Thank you Sandy! I appreciate that! I had several successes doing a double batch of PIP rice in a Fat Daddio pan and then my daughter mentioned that she did hers in Pyrex bowls, which I picked up on Black Friday. Both times I have attempted PIP rice in Pyrex, it has failed. It had unabsorbed liquid in the rice and the rice was crunchy. The recipes were the same as I had done before and the amount of rice was the same. Any idea why the Pyrex method isn’t working for me? I’d prefer the Pyrex method so i can throw it in the dishwasher! Thanks for any insight you can provide! The cooking time for rice can vary based on brand. If you have a time that works directly in the inner pot, you probably want to increase cooking time by a minute. Note that pot in pot can require more cooking time. I use my Pyrex a lot for rice and I cook for 6 minutes for Basmati and 4 minutes for Jasmine in the Pyrex. What times are you using? I have successfully used 6 mins and 7 mins for long grain white rice using PIP. Not a huge fan of the texture (or price!) of Basmati and Jasmine. Maybe I’ll just have to get myself the 3 qt Mini for rice! ? Dorothy, thanks for your question. Sirloin may be too lean for the pressure cooker, and you might end up overcooking it. I’d hate for you to waste your meat. The pressure cooker is best suited for tougher cuts of meat with more marbling, like a crock pot is. That being said, is it pork? You could try to follow this recipe from Pressure Cooking Today, but since your meat is smaller in size, reduce cooking time by 5 minutes. Make sure you do a full Natural Pressure Release (NPR). Good luck. I have just purchased a 3 quart Instant Pot and used for first time yesterday. I did a roast that unfortunately did not have much fat on it but other wise it turned out okay. Is there a recipe book (with good instructions) for use with the 3 quart pot. Hi Maureen, most likely your dish was affected by the cut of meat than any other reason. To adapt recipes for the 3 quart, you should just need to reduce the quantities in equal proportion e.g. halve all ingredients. (The exception is the liquid – you need the minimum amount required to reach pressure. How much depends on what you’re cooking – e.g. if you’re cooking something that’ll release liquid as it cooks (e.g. vegetables), you can get away with less liquid. I’ve used as little as 1/4 to 1/2 cup. The official word is 1 1/2 to 2 cups.) You also would generally cook for the same amount of time as the recipe states. http://www.simplyhappyfoodie.com has some recipes specifically measured for the 3 quart mini. Search for “mini” in her search bar. I don’t know of any recipe books though. If you want to make any of my recipes, I’d be happy to answer any questions you have regarding reducing the recipe! thank you very much, I am looking forward to using it more. I appreciate your assistance and offer. This is very well written. Even though i have been using my IP for a year now, and have used the pip method quite a lot, i had problems with the pip method for some of the recipes I had made. After reading this, I realized why some of the pip recipes were not cooked fully. I was usings methods that slowed down the cooking without knowing i was! Thank you for sharing all this wonderful information. Hi Connie – I am not sure of this but I think that anything that can be cooked in the crockpot probably can be cooked with a container within the crockpot (??) So rice wouldn’t work since you can’t slow cook rice (as far as I know!). Good luck! 1. Will 1 cup be enough to add into the inner pot? 2. What is the water to peas ratio to add into the Pyrex bowl? Does the bowl need to be covered? 3. Should I use the “Steam” function or Pressure cook and what is a good time for 1 cup of peas? Hi Dhanya – 1. yes, 1 cup is fine 2. If you’re steaming frozen peas, you don’t even need any water since you’re doing PIP. 3. Steam is the same as pressure cook but only has high pressure I believe. You probably only need to steam for 1 minute, maybe even 0 minutes. If you find that it’s still overcooked, next time do low pressure. Hope that works for you. Great information, I was wanting to try PIP and now you have given me all the answers to questions I had. Hi Sue – thanks for commenting and you’re so welcome! Thank you for this article – very helpful! I pinned it :-). I just got my stackables and used for the first time last night. I tried cooking a 6 ounce salmon filet on the bottom and broccoli on the top. Regular pressure for 2 minutes, natural release. The broccoli was very al dente (perfect for me – so happy! ), but so was the salmon which I prefer rare. So if you don’t mind I have a few questions! I put 2 cups of water in the IP per the instructions for the recipe that came with the stackable (Ekonova) and cut the cooking time down from their recommended 3 minutes to 2.It took 10 minutes to come up to pressure and and additional 10 minutes to cook (the 2) and then NPR. 1) Do you know about what temperature the bottom and top pots are cooking at? Does the bottom pan cook faster? My stackables came with 2 kinds of covers – one solid and one with holes – I wondered when use of each was indicated? Wasn’t sure if the one with holes would make it cook faster as steam gets in??? Hi Marcie – I don’t think that the top and bottom containers are cooking at a different rate, but I’m not 100% sure of that. I do know however, covering up the container completely slows down the cooking. So your instinct is right on that. I think you’ll just need to experiment and find out what works for your IP. I keep an IP journal where I write down all the timings that work for me. Regarding the water in the bottom, you might want to experiment with less water and see if you pot comes to pressure and maintains pressure – that would save you some time because it would take less time to come to pressure. Thanks for your question. Oh! An IP journal – I love that. I have found that my IP seems to take longer than most recipes say, and keeping it all together is a great way to try to figure that out! I use mine all the time – hope it works for you too! And every time I cook something, I mark the changes! I’ve read the bottom container cooks more, if for no other reason that it’s closer to the heating element and hot water. With metal stackables the metal will conduct heat to the food faster than glass and if the bottom is touching the water it goes even faster. Most stackable recipes say to put the longer-cooking food on the bottom. Diane, thanks for your input. I haven’t had the opportunity to notice a difference in the levels. I’ll have to make it a point to check next time. Can you use the pot in pot method for APPLE CRISP? 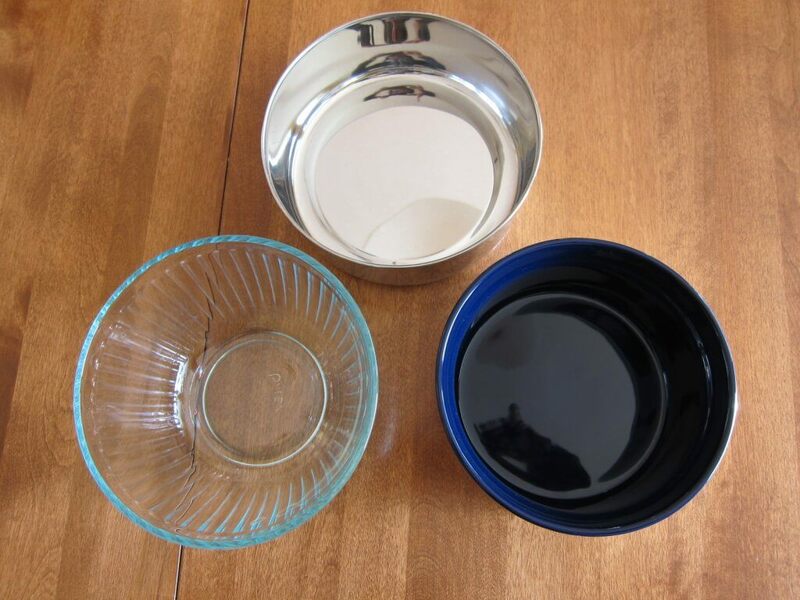 If so, would the smaller pot (corning ware bowl) need a LID? There’s 1/2 cup of water in my recipe, but do I still need to put MORE WATER in the BOTTOM of the stainless steel insert pot, below a trivet? Hi Louanne – yes, I think you can use the PIP method. You don’t need a lid, but you might want to cover lightly with foil so that condensation doesn’t drip in. 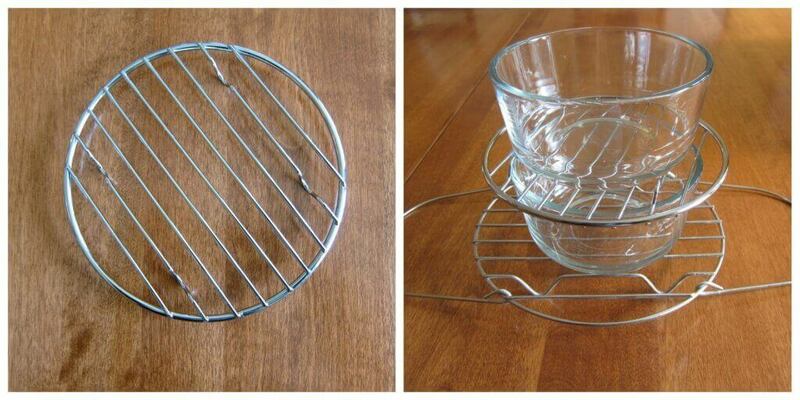 Yes, you always need water on the bottom of the inner pot under the trivet. Good luck! Hey Kiddo – I am sooooo impressed with your information. I have looked and looked and again looked for easy to understand info on the PIP…..you nailed it in spades. Thanks a bazillion percent! Hi Sara -you’re welcome! Good luck trying out PIP. I really like the way you explain and show PIP methods, especially stacking the trivets. However, after having questions, researching and contacting companies such as Anchor Hocking, Starfrit and Pyrex, no glass is IP safe. Old PYREX is the safest but anything after 1998 is spelled pyrex (no caps) and made differently. Many people say they use glass and haven’t had a problem, but I’d say a chance of one exploding container is one too many. Glass is use at your own risk and the companies mentioned state they will not be held liable if if injury results. Thanks for sharing – it’s always good to be vigilant. Hi Susan – the turkey breast cooks for much longer than potatoes do. So I’d either do one after the other or release pressure on the turkey breast part-way through cooking, add the potatoes and complete cooking. I hope that helps! You also might try cutting up the turkey into but sized pieces and using large, whole potatoes with the skin on. Just be careful and use a thermometer on the turkey to ensure it’s safely cooked. Good point, John. Thanks for adding your thoughts. Thank you so much for this abundance of information! So very well written! You are awesome! Awww thank you, Georgie! I’m glad you found it useful. I used 2 stainless steel inserts to cook carrots with sugar and butter. I put 3 cups of water in IP . then placed the two inserts with the carrots inside the IP. Insert were closed. The I pressure cooked for high pressure 10 minutes with quick release . carrots were still raw and butter an sugar slight melted . what happened? Hi Veronica – I’m assuming your inserts were on a rack? It sounds like your Instant Pot didn’t even heat up, let alone come to pressure especially since the butter didn’t even melt completely. I would try it again, and this time as a baseline test, don’t cover the insert. Make sure your float valve pops up. Let me know how it goes! Isn’t three cups a LOT of water to use to cook carrots? I”m still learning. Thank you. Diana – is the recipe for steaming or boiling carrots? If it’s for steaming, you can just put 1 to 1 1/2 cups water (depending on the size of your Instant Pot) and a steamer basket with the carrots. For boiling, I suppose you have to have enough to cover the carrots. Hope that helps. It’s about the physics of heat transfer. The IP gets to ~240 degrees F on high pressure. The steam in the pot is 240. To cook the food that heat must transfer to the walls of the ‘inner’ pot then the air surrounding the carrots, then finally to the carrots (convection). Food in contact with the ‘inner’ pot heats a bit faster (conduction). There’s also a time lag. The air in the IP is at temp before the air in the ‘inner’ pot. Air is an excellent insulator and water is a good conductor. If you were to put carrots and butter in a covered metal pan in a 240 degree oven for 10 minutes you wouldn’t expect them to cook. Same thing. PIP is handy but it adds layers of insulation, which is why it does so well for some things. PIP food in liquid gets heated directly from the walls of the ‘inner’ pot and goes faster because it’s conduction. But it’s always faster without PIP. Either allow more time or cook carrots in water directly in the pot, use saute to evaporate the water and add butter at the end to glaze. They only take a couple of minutes because they’re in contact with 240 degree water and they are heating up along with the water as it comes to pressure. The bottom layer of PIP cooks faster because it’s closer to the heating element and through conduction of the rack from the hot water under it. Once you get the basics of heat transfer it’s easy to figure out which method works best for each dish. Hope this helps. Thanks for all the great info. I understand that the inside receptacle should not rest against the inside of the IP. my question is, what if it just fits? That is, I’d say there is approximately 1/2 to 3/4 of a cm of space surrounding my 9″ springform pan , while it sits inside the 8quart IP ultra. I want to make sure that’s sufficient space for steam to pass and not ruin the IP or cause any issues. Thanks! Kari, I’ve not ever had that tight a fit but I would think that as long as there’s some space around the bowl, there’s room for steam to escape. I’m glad to hear that you’ll try the Thai dishes together via PIP! Thanks, I am really happy to see these tips. I am making Louisiana style red beans and rice in my Instapot. This technique saves me from taking out my red beans and putting them in a “serving dish” as you stated—to get cold and then to rewarm them as best I can (which is silly because I have hot rice getting cold while I microwave or reheat the beans). The major tip here is you need to be aware of quick release versus natural release, and I never see many recipes for QR. But I will look for that and make sure to harmonize accordingly. Hey donna, I’m glad you’ve discovered PIP cooking; it’s very useful for many situations! Ed, you’re so welcome – happy PIP cooking! Arthur, I really don’t change the cooking time and have no issues with my food being undercooked. I would try the same timings and see how the recipe works for you. You can always pressure cook it for another minute or two if needed, and also adjust next time you make it. Thanks for your question. I’m afraid we’ll have to agree to disagree – I find my Instant Pot curry recipes to be as good as the stovetop version 🙂 I also have readers who like to cook recipes like Thai curry but don’t have access to a stove. Since my blog is an Instant Pot site, I try to make sure I give people delicious recipes that can be made in the Instant Pot. I just found your blog by using our good ole friend google. What an incredible blog! Thank you for all these tips. I’m a frequent user of regular PCs for decades, thought I give it a try with a 6qt DUO since it was 40% off. Could not be happier. Excellent, Ina! I too had used a pressure cooker for my whole adult life and grew up with my mom cooking with one. Love the Instant Pot so much! Thanks for this article. Can you recommend a larger container than the Pyrex one? I’ve been getting the burn message, and decided to try the PIP method with the Pyrex bowl. However, my dish won’t fit into the bowl, and lowering the quantity means there won’t be enough servings. Hi Vas, if you have a 6 quart you can use a container that’s about 5 inches tall and 7.5 inches in diameter. It’s not easy to find that size! Your other option is to use the stackable container and fill both compartments. Actually, you can push the size a bit. The Ikea Blanda s/s bowl (20cm/7.8″) works great in the 6qrt/litre model. Thanks Jim! That will be useful to other readers. Thank you for all the information you provided in this post. It has answered a lot of question. I only have one more question. Are you familiar with WECK jars? They are European style mason jars. They come with a glass jar, a rubber ring, a glass lid and clamps. They are normally used for canning. I have seen recipes for making homemade extracts using a Ball mason jar that uses the technique you described in this post. The recipe says that you barely close the lid of the mason jar and follow the same steps you described. Do you think I could use the same technique with my WECK jars? Can I safely use them with the rubber ring and clamps? Great question and short answer is “I don’t know”. I think I know the kind of jars you’re talking about. The recipes you’re looking at have lids that are screwed on, and you close them so that they aren’t airtight, just finger tight. This allows air to escape when pressure builds. I am not sure if the jars with clamps close the lids airtight. Sorry I couldn’t give you a definitive answer. I am used to Indian cooking in steel pressure cookes using stackable steel containers. Now that I have switched to IP I want to continue the same method here also. My question is , is it necessary to use the same container that IP comes with or I can use any similar container that fits inside IP properly? 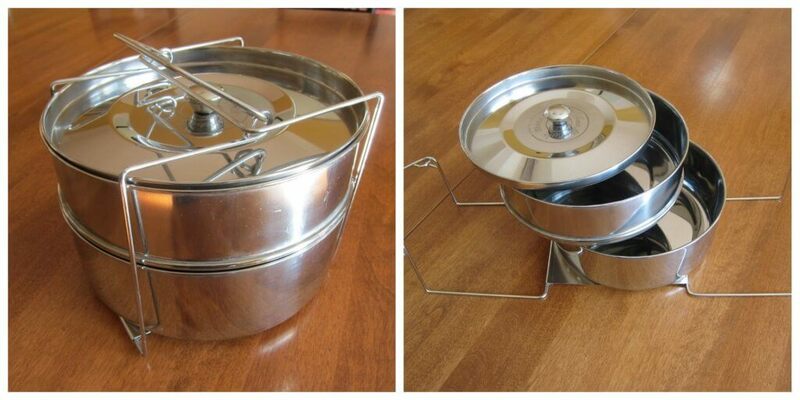 That way I can use original pot for direct cooking and other container for PIP cooking. Let me know. Hi Maratha – thanks for getting in touch. No, you don’t need Instant Pot-specific containers as long as they are safe for a pressure cooker and you should have a clearance of about 1/4 inch so the edges aren’t touching the inner pot. Hope that helps. Thanks for a quick, concise summary of PIP. Just what I needed when my (preferred thick) marinara kept getting a burn message. I figured this would be the trick, but it sure helped to have your experience and wisdom available online! Glad to be of help, Jeri! I have a question about a stainless steel bowl I have that I’d like to use – it’s perfect, UNTIL placed on the trivet – then it becomes just slightly too tall. The bowl is the kind that came back in the 50s and 60s with the Sunbeam or Oster brand kitchen centers: it has a ring on the bottom Here is a picture of one in case you don’t know what I mean. https://bit.ly/2Qcxnhm My question is this: would the rim and hollow on the bottom of this bowl suffice to raise it up off the IP’s bowl so that I do not need a trivet? I’m afraid to try it because I’ve only had my IP for a few days and am still QUITE the rookie. Please help me! Thank you! Diana, normally I would say you need to have the pot raised in order for heat to be transferred properly. However, since your pot has a ring base, I think that actually would work. I would try it out with something simple first. I don’t think you need to worry about safety. I’d love to hear back from you if you try it out. Hi, can I use aluminum pot in IP? Sam, I use an anodized aluminum push pan for cheesecakes and it works great. Hi! I read your article and thought pot in pot would be great to solve the problem with scorching I’ve been having with my 8 qt duo. I hate getting the dreaded burn notice. However, the recipes I get this with are usually ones that start with sautéing. How would this work with the pot in pot? Thanks! Heather, you would have to empty out the contents of your inner pot, clean and then proceed. Have you tried to cool down the pot completely (after deglazing)? You might want to try that out – I find that some burn errors can be avoided by doing that. Also, try layering your ingredients. Good luck. Thanks for the information-packed article. You say to choose the inner container or stacked containers so they “allow the Instant Pot lid to be closed easily.” Does that mean they can be taller than the Instant Pot’s Max Fill line? If the inner pot(s) are above the Max Fill line, does the top of the *food* in them have to be below the Max Fill line? Yes, when I do PIP cooking, the top of the bowls go above the max fill line. The quantity of food in the bowls should account for any expansion (e.g. rice). Hope that helps. Hi! I am not having much luck with the stackable pots in the instant pot. Previously, I prepared a recipe with chicken thighs and cooking sauce in the bottom of instant pot. Then I placed a tall trivet over the chicken and an open pot of rice. Cooked for 10 minutes with 10 minute release. It was perfect. Then I did the same thing using the stackable pots. I put water in the IP liner then the stackable pots with chicken and sauce in bottom and rice on top. Neither the chicken or the rice was cooked. I’ve tried it several times with the same results. Any ideas? Jenny, I wonder if your stackable containers are thick and so need to have increased cooking time. You might need to do some experimenting. Why don’t you try to cook just rice in one of the stackable containers and see how much longer it takes to cook? Then you might have a ballpark percentage increase in cooking you might need to add to all your recipes cooked in the stackable container? Have you ever used a smaller Instant Pot’s liner for the inner of the pots using the pip method with a larger Instant Pot? In other words, could I use a 6qt liner for an inner pot with a 8 qt Instant Pot? Is it too tall to fit with a rack below? Rob, I think you can fit a 3 quart inner pot but not the 6 quart – too tight a fit. Do you think thT I ça purchase a 3qt. Inner pot to use for rice for PIP in my 6 qt? Dorothy, you do need water in the main pot (inner pot). The steamers will sit above the water. You should be able to get away with about 1.5 to 2 cups depending on the size of your Instant Pot. I am not aware of a pot in pot recipe book, sorry! Thanks, Cheryl – it’s my pleasure!